Check out Lyne Turcot, Westburne’s Admin & procedures divisional Director’s advice on getting active! 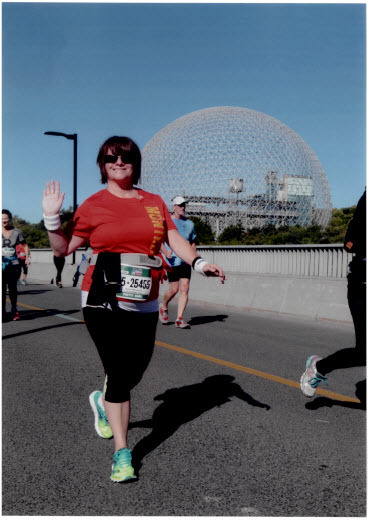 In 2011, Lyne finally decided it was time to push herself and started training for her first half marathon! No matter what you do, you will quickly see the advantages, Lyne shared. She says she was not a very sportive woman, so she decided to start walking at first. With time, walking became jogging, the more she jogged the better she felt. Her number one piece of advice is to find what feels best for you. “If you walk, if you run, if you do anything else, even on your head, that does not matter. Just find what you like” she says! Lyne participates mainly in the Marathon Rock’n’roll Oasis of Montreal. She trains all year long, many times a week with the aim of this exciting day. The best part of this day, is that she notices and the team spirit of everybody. The supporters, the participants, the athletes, all have a common purpose: it is to have fun! She says the supporters transport us with their energy! • Some discipline, few times a week. o After a while, this discipline becomes a necessity. o Your body and your brain are going to demand it. • A plan of training. o make sure you set realistic & measurable objective. • And your beautiful smile.